Well before winter, the Architect of the Capitol (AOC) prepares snow equipment, procures rock salt and ice melt supplies, and reviews the emergency and essential personnel snow response plans. And with good reason. Clearing snow around the Capitol complex in January 2018. The AOC is responsible for the maintenance, operation, development and preservation of more than 18.4 million square feet of buildings and 570 acres of land. There are more than 14 miles of sidewalks, 7 miles of streets and drives, and about 20 acres of parking lots and plazas to clear and keep free of snow and ice. A significant storm requires a lot of work and cooperation across all facets of the agency to ensure the campus is safe for members, staff and visitors. AOC's Lee Dennis leads a review of equipment and safety procedures. 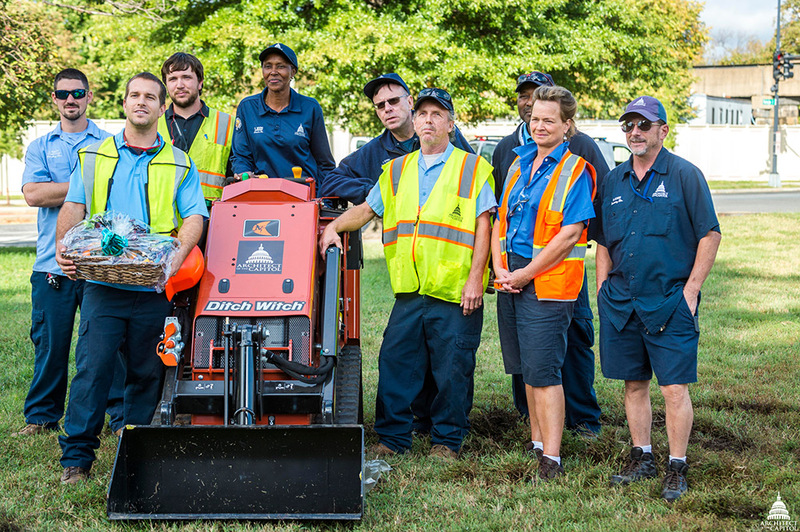 "We do a lot of refresher courses for seasoned employees and training for new employees on the equipment. And we do several dry runs to make sure everyone is prepared for snow," said General Gardener Supervisor Ralph LoJacono. 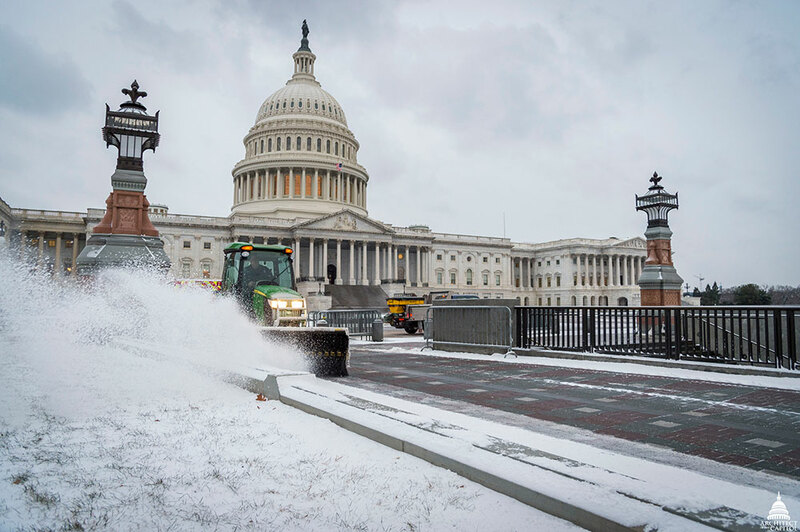 "We also coordinate and share information with the U.S. Capitol Police, AOC Office of Security Programs and the District Department of Transportation on forecasts, snow clearing needs and other storm preparation essentials," he said. General Maintenance Supervisor Lee Dennis manages heavy equipment and supplies including more than 500 tons of rock salt to keep road surfaces clear and 20 tons of deicer for the sidewalks and steps. "If the surface temperature is below 28 degrees and we get 6 inches of snow or more, we can quickly use 200 to 250 tons of product to help remove snow and ice from the campus," he said. AOC employees test out the newest snow removal tool. 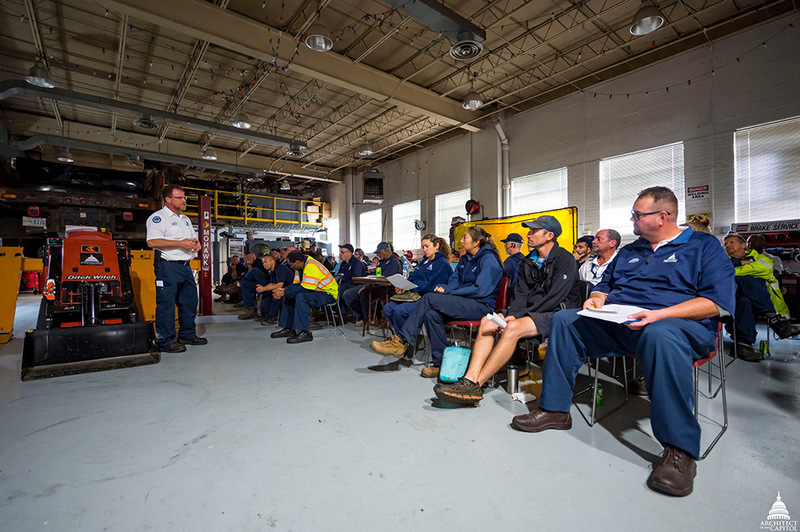 This year, Dennis organized a cross-jurisdictional training session on safe snow removal procedures. 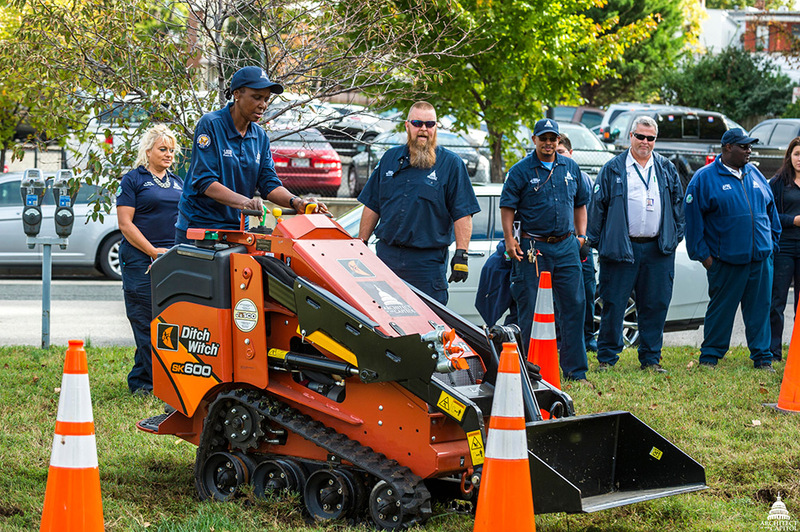 Dubbed, The Snow Rodeo, the training exercise included a friendly competition between offices and jurisdictions on a new piece of snow removal equipment, the Ditch Witch SK600 mini skid steer. The machine has a narrow frame for better maneuverability in tight, compact spaces like the bollards that ring the campus. 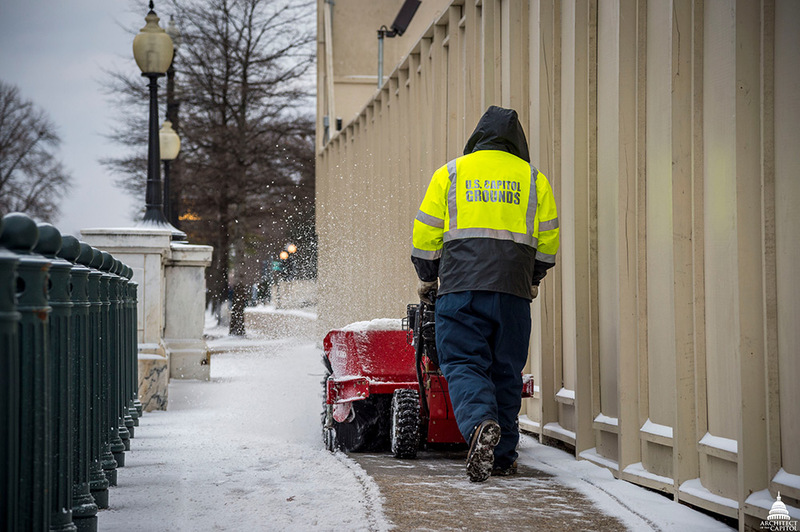 The Capitol Grounds team anticipates using this piece of equipment to decrease the amount of time and resources it takes to clear snow and ice between the security barriers. The Ditch Witch SK600 has an efficient, low-maintenance engine to power through snow in those hard-to-reach places. Additionally, the machine is capable of having numerous attachments to perform a wide range of tasks, including a narrow bucket for snow removal. Employees from multiple AOC jurisdictions participated in The Snow Rodeo. 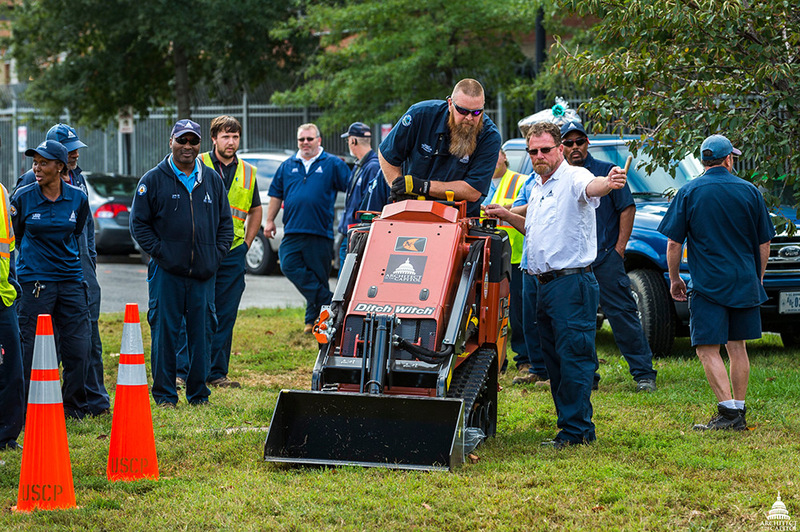 Representatives from Capitol Grounds, Supreme Court Building and Grounds, Library Buildings and Grounds, and the United States Botanic Garden participated in The Snow Rodeo and found the plow easy to operate. Competitors successfully maneuvered it through cones set up in a course made to resemble rows of bollards. In the words of Dennis, "It's not how fast you plow, it's how well you plow fast."